I created this site so that others weren’t as lost in the abyss as I was when it came to looking to buy a katana. I did some research as well as tested some merchants out and wanted to help others cut through the clutter and find a good place to buy a sword. When I first started looking to buy a sword I wasn’t sure what to even get. I just had ‘sword’ in my mind, not really realizing what i could do with it. I wasn’t sure if I wanted a katana, a tanto, a long sword, etc., heck I wasn’t even sure the difference between any of them really. As I researched more on the topic I geared toward the katana sword where I then learned about various martial art forms I could engage in with it; ‘back-yard’ cutting, Iaido, Noto, and much more. As I progressed through the phases of selecting, buying, and using my katana I realized others may be struggling with the same issue and not sure what to do, where to go, or what to get. Because of this I created this site which originally was intended to be a quick, go-to, straight forward resource but realized I was missing some valuable information. 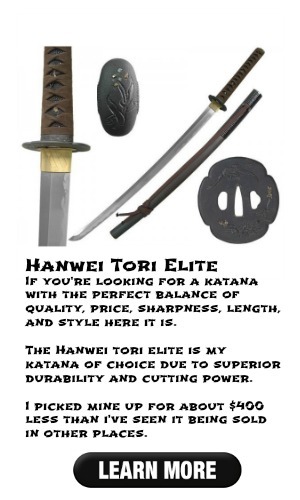 I then went back and revamped the site to create a guide to purchasing your first katana. Whether you’re interested in buying a sword now or just curious what makes a good katana, I’ll provide you with some info to make a clear cut decision on if a katana is even the type of sword you are looking for or if maybe you think exploring other avenues would better suite your interests. Questions? Shoot through an email via the contact form and I’ll get back to you. But if you’re already the sensei of samurai and know what you want you can just skip straight to my katana reviews.